No? Me either, no clue, I had to consult the only person I would know for sure, Mr Google. 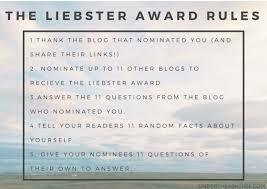 When a very lovely like-minded mummy from Claire Bear Blues nominated my blog for a Liebster award, I had no idea what it was. I had to Google it, and a small part of me hoped I’d won a lobster, sadly I hadn’t won a lobster but I had been nominated for an award in the world of blogging. To hear that I’d been nominated was very heart warming. Initially I wrote as I just needed to get my thoughts out, but sharing these with other bereaved parents, it has introduced William to the world. It fills me with so much pride that William is helping others. So here goes…. All my life I’ve wiggled my toes, but since William died, I haven’t, William used to do it too. I like mint sauce on anything. I have orange juice on cereals rather than milk. I love donkey’s, I’ve always wanted 2 donkey’s. I am doing a degree in economics. I have no balance / co-ordination. I really enjoy crafts, so cross stitching especially. My favourite book is Juliet by Anne Fortier. The best thing that ever happened to me was being blessed with William, and the worst was having him taken away. I write because my mind is so full I need to write down when my mind and thoughts spill over and my head is muddled, this happens quite often! I write now because I want the world to know about William. 2. When did you begin to write? I started to write in January 2015 the month after William died. 3. Did you start this initially for someone else to read or just for yourself? Initially I started to write just for myself, I needed an outlet, somewhere I could express my thoughts without being judged or analysed. I think a part of me feels like William can read these words, he is part of everything I do. I’ve received tremendous support from readers of my blog and you have become part of our journey. I write whenever I can, a lot of the time I write and somehow seeing my thoughts in black and white makes it real, so I write as often as I can as for me it is a way of unjumbling my mind. 5. Is there anything you are afraid to blog about? No, I am no longer afraid of anything, and I have no fear of sharing my darkest thoughts. 6. What do family and close friends think? They are extremely supportive and in some respects see it as an insight into what is going through my mind. On the outside I can be smiling but on the inside my heart is breaking. They love the little photos and videos of William and learning about the little person who I hold so dear. 7. Do you share your blog often? I share my blog every time I write a post. 8. What has been the best aspect of blogging for you? Writing is very cathartic. Being able to express how I feel and sharing my love for William. One particular memory stands above the rest. A lady contacted me from America and explained after reading my blog she insisted on a second opinion with a pediatrician for her son. He in fact had pneumonia and fluid on his chest. He was admitted to ITU and made a full recovery. She thanked me personally for raising awareness. 9. Are there any differences between your online persona and your in-person one? No, what you see is what you get with me. I write about something so personal, and anyone who knows me will know that I speak the same of William in person as I do in my blog. 10. Do you mostly write, or do you read too? I mostly write. I love to read but have found since losing William that I am unable to focus as well, so I don’t read as much now. 11. What is one quote that fits your life right now? Write Meg! – Another take on writing, reading, loving and eating! How do you feel when you’ve written and shared a blog? What inspires you to keep going every day? Are there any differences between your online persona and your in-person one? 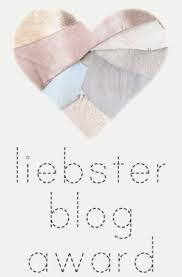 Which blogs do you check daily? In your opinion, what’s the best blog post you’ve written so far? Give us the link. What’s the most breathtaking sight you’ve ever seen? What is the one thing you must have with you when on the go? What’s your favourite place to go and write? What is the one quote that fits your life right now? This entry was posted in Uncategorized and tagged blog, blogging, child loss, death, depression, grief, liebster award, loss, mental health, pain by amotherwithoutachild. Bookmark the permalink.